Discovery Dinosaur Central | "A Stitch in Time"
We return to our dinosaur days with Emanuel after a busy December with a rather interesting herbivore, the Apatosaurus who is often miscalled the Brontosaurus! Or as Emanuel called it, another long neck dinosaur. Which are his FAVOURITES! So of course there were links, videos and a colouring page. Let’s start with the video I cannot post in the blog itself. HERE is the link to the Discovery video on our dinosaur of the day. And below our I’m a Dinosaur video for you to watch right now. 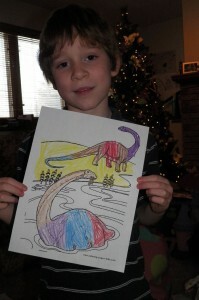 Now for the links about our long necked dinosaur. And by long necked we mean potentially long enough to not be able to lift it up to eat of the tops of trees! 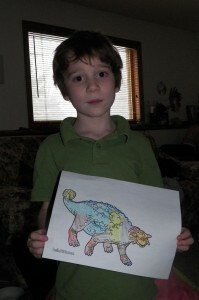 First there is the Kids Dig Dinos site with their page HERE. Then Kidsdinos.com with their charts HERE. Thefreeresource.com has a lot of rather technical classifications HERE. EnchantedLearning has two pages of interest… the page HERE and the fact sheet HERE. And let’s not forget our colouring page HERE. Though it is a bit misleading as all the information we found stated that it is not believed that they would swim… so we imagine that these dinosaurs were just cooling off. There is also a terrific page HERE from Science Kids. And, finally, the technical Wikipedia page HERE. 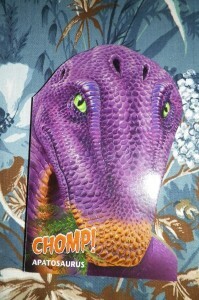 We actually chose this dinosaur due to a random find at JoAnn’s of a boardbook. This late Jurassic period dinosaur certainly sparked that interest back in Emanuel! So I will continue the daily trend… hopefully our research will help others with their love of dinosaurs! QUETZALCOATLUS Try and Say That 3 Times Quickly!! The Quetzalcoatlus was around during the Cretaceous period and was one of the last flying dinosaurs or Pterasaurs. 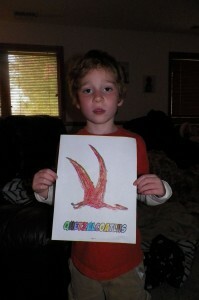 It had a long neck and a toothless beak. It was without feathers and instead had tiny hairs on its body. It was potentially cold blooded. The wings of this beast tied into its fourth finger and it most likely walked on 4 legs. It was definitely a carnivore, though what particular meat it ate (carcasses like a vulture, skimming fish, or attacking land animals) is unknown. They were massive and amazing and as Emanuel says with great joy – AS BIG AS AN AIRPLANE – WOW!!! Now for the videos. Our first one was a catching song. Everyone boogied along to the music while we enjoyed the images. You have to go down the list on the site of our second video. But dsc.discovery.com has some great educational videos about various dinosaurs at THIS link. We are going to go down the list and see what other videos they have on our dinosaurs of choice. Triceratops was the first video! And now the links… We started with this article form site HERE. Emanuel loved the picture at the top, though we did gloss over the “seeing” of one in current times. Then there is the dino fact file HERE that had a nice little blurb about our massive flyer. EnchantedLearning had a great page to check out HERE, though their Tyrell Museum link is a dead one. About.com had 10 facts to know about the Quetzalcoatlus HERE that was rather helpful. The Melbourne Museum was helpful once again HERE. Kidsdinos.com has a nice write up and map HERE. TheDinosaurs.org has a great page about this dinosaur HERE. Now don’t forget about our colouring pages HERE. So, hopefully these links and videos help you and your dinosaur lover learn more about the biggest flying animal EVER!! We really enjoyed learning about him!